Made using a sealed cap container to help keep the contents clean and safe to help moisturise, soothe and protect dry and chapped lips. 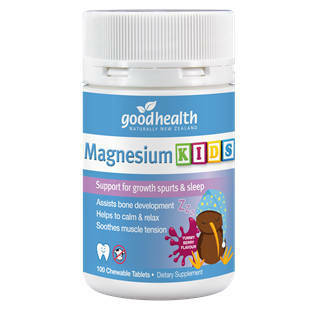 Good Health Magnesium Kids Chewable tablets comes in a yummy berry flavour magnesium supplement especially formulated for children 4 years old and above to support growing pains and sleep. How do I take this Magnesium for Kids? Children 4-8 years: Chew 1-2 tablets daily or as professionally advised. Children 9 years +: Chew 2-6 tablets daily or as professionally advised. Keep out of reach of children. Do not give Good Health Kids Magnesium if your child has a known allergy to any of the ingredients listed. Always read the label and use as directed. Have you heard of growing pains in children ages 3 to 15 years old? Do you know that one in every five children can experience growing pains? Some of the common signs that your child is going through growing pains are: muscular aches and pains in both legs, which are usually present in the calf, behind the knee and in front of the thigh. Your child can also experience intermittent pains that are usually every night for a week and may then disappear for a week but with the chance to return again. The pains can also start late afternoon or evening and can get worse during the night strong enough to wake a sleeping child. Magnesium is known to help in the many functions of the body, but is most especially helpful in supporting muscular health. But most magnesium supplements are not age appropriate and is mostly suitable for adults. Good Health Kids Magnesium Chewable Tablet is specially formulated for children age 4 years old and above to aid in supporting growing pains as well as help with improving sleeping habits and aid to soothe muscle tension.